One night in a bunker two Commandos were joking with one another to keep their morale and spirits high... SSG Bilal Rana turns to his friend and says "yaar, mera bulava aa gaya ha... Lekin promise me one thing... Take this grenade of mine and should the enemy get close, use the grenade but never be captured by them... And one last thing, should you have a son, name him Bilal" and with this sentence they both erupted with uncontrollable laughter... On the 10th Dec 1971, whilst on a mission, Rana Bilal fought bravely and embraced the highest honour of Shahadat. Suleiman barged into the underground dug in bunkers of Eastern Command in Dacca Cantt, (the War HQs of East Pakistan was known as Eastern Command)... full of anger/rage with his loaded kalashnikov rifle in hand... He looked Gen Niazi in the eyes and refused to accept the orders of surrendering... confronting the arrogant Gen Niazi, at one stage the Gen emphasised " I am the Commander and I order you to surrender". Suleiman replied, " You have accepted defeat and you are surrendering. You have LOST the moral authority to be Commander. I refuse to obey your orders." On the eve of 17th December 1971, The Phantom disappeared into the darkness of the night & was never found by the enemy... escaping to Burma. BUT... when Suleiman left HQ Eastern Command he didn't escape alone. Maj P.D.Khan who was 2nd in command of 2 Cdo Bn (Suleiman's Bn) was in CMH Dacca with a bullet in his knee. Suleiman went to CMH and asked P.D to accompany him. P.D refused explaining that because he was badly wounded he would hamper Suleiman's escape. One hit on the neck & PD was unconscious. Suleiman lifted wounded PD and brought him all the way home in W. Pak. PD later became Lt Gen P.D.Khan and commanded the famous 10 Corps Chaklala. (this paragraph added courtesy of SSG Col Mohammad Arif ). The lonesome Soldier did not allow the enemy to stain his Khaki... He returned to his Mother and Motherland as a BRAVE GHAZI and both he and Gen Musharraf went on to name their sons Bilal after their friend, Bilal Rana Shaheed. 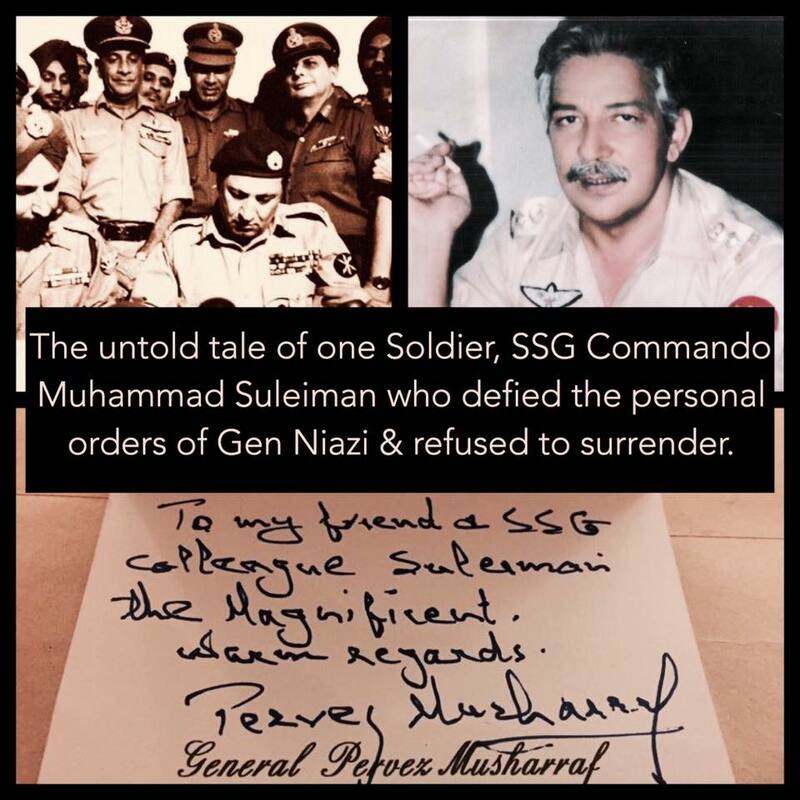 Now we all know why Gen Musharraf and so many in the PakArmy till this date call him "MUHAMMAD SULEIMAN THE MAGNIFICENT" !! !